Brechin City did not have much of a look in at the early stages of the game at Tannadice Park. The home team were in fine form, and their open play was all that could be desired. The forward combination repeatedly got within range of the visitors' citadel, but many of the splendid rushes finished poorly. Shooting was their weak point, and any shot that reached the goal was easily held by Balfour. The halves were just a little uncertain, but these were backed up by the fine footwork of the backs. Brechin's show in the first half was poor. The players seemed unable to settle down, and for the larger part played too close a game. They were allowing Hibs too much scope. Docherty was not slow to take advantage of this, and his shot gave Balfour no chance. 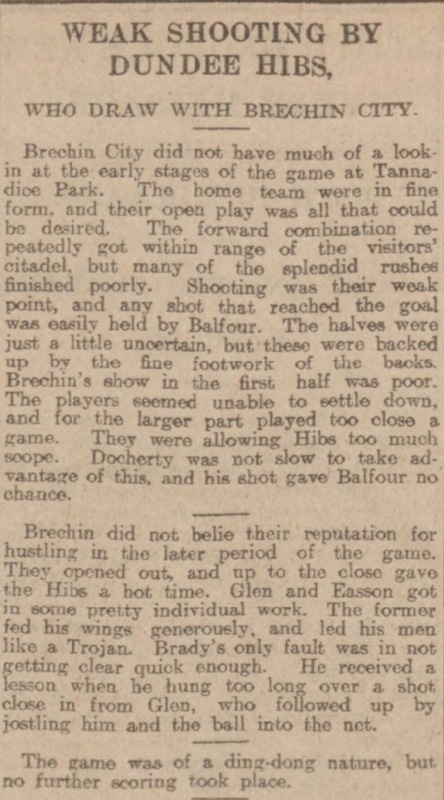 Brechin did not belie their reputation for hustling in the later period of the game. They opened out, and up to the close gave the Hibs a hot time. Glen and Easson got in some pretty individual work. The former fed his wings generously, and led his men like a Trojan. Brady's only fault was in not getting clear quick enough. He received a lesson when he hung too long over a shot close in from Glen, who followed up by jostling him and the ball went into the net.